Otaki is a relaxed, beachside town just one hour’s drive from Wellington or Palmerston North. We are blessed with a beautiful sweeping coastline of soft sand and blue waves, perfect for swimming, surfing, fishing or just lazing in the sun. The sunsets here are just breath-taking. 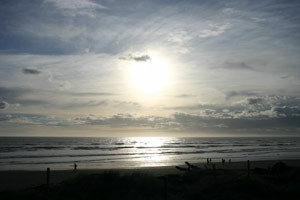 Byron’s Resort is located within a 3 minute stroll of the Otaki beachfront. As you drive through Otaki’s Main Road, look out for the big green BP Petrol Station on your right. At the roundabout, turn left into Mill Road. Follow this road and go through the Otaki Township shopping centre, straight on to Tasman Road and out to us at the beach! We are on your right at number 20 Tasman Road. As you enter Otaki’s township, look out for the big green BP Petrol Station on your left. At the roundabout here, turn right into Mill Road. Follow this road and go through the Otaki Township shopping centre, straight on to Tasman Road and out to us at the beach! We are on your right at number 20 Tasman Road.